My baby is now 4 months, 3 weeks old and in reality it's not all that long since I had my baby, but part of me feels I should have done more about the extra weight I gained by now. I got rather big while I was pregnant as you can see in the photo, but it was all belly. From what I could tell I hadn't put much weight on elsewhere. 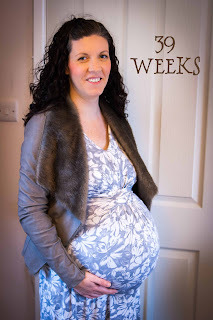 For the 9 months of being pregnant I had very little chocolate or sweet things as it made me feel sick. But I did have a packet of crisps daily, the salt helped neutralise the nausea. After I'd had my baby I liked all things sweet again, so it was like I was trying to make up for lost time. Allow yourself time to eat what you want. I'm glad I allowed myself time to just eat what I wanted without thought. I'd had 9 months of nausea, heart burn and being sick. The last thing I needed to do was start worrying about what I was eating when I had a new born baby. Although saying that eating healthy was important, especially at first when I was feeding my baby breast milk. The meals I had frozen before he was born really helped with having good, nutritious meals. But I wasn't counting calories and if I wanted bread with the soup or stew I had in the freezer I did. Try not to worry about how your body looks. Remember you've sacrificed yourself to create a new life. That's a huge thing to give, don't be so hard on yourself. I knew I'd have a belly after giving birth, but I wasn't prepared for just how big it would be. I still felt pregnant, and probably looked it to most people. This photo was taken when my baby was just 1 day old and it's the first time I've shown it to anyone. I shouldn't have felt embarrassed by it, but in a way I did. The way my tummy looked really got me down, I hated to see it and certainly didn't want anyone else seeing it. My husband tells me I'm beautiful and although I believe he thinks that, I don't always feel it. I'm not sure what the answer is to this. I know I feel better now because my belly has gone down a lot since I gave birth. So I guess the answer is this, things pass, give it time. Buy some bigger clothes while you still have your baby tummy and are working at loosing a bit of the weight. One thing that really helped with feeling like I was getting back to normal was buying some clothes that fit. I needed to get out of my maternity jeans and my pre-pregnancy jeans still weren't fitting. I didn't want to buy myself much in a bigger size as I was hoping to eventually get back into my old clothes. 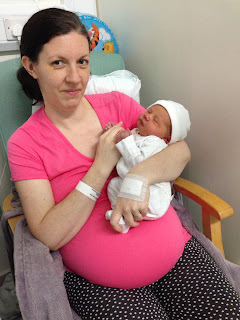 But having a few clothes that fit properly meant I felt like I wasn't pregnant any more and the clothes weren't digging in, making me feel uncomfortable at a time when I was recovering from a difficult birth, all because they didn't fit. When you're ready to start trying to loose some weight, find a plan that works for you. A few weeks ago I'd decided enough was enough, I needed to do something drastic as I was getting out of control with my eating. And if I wasn't careful I'd be back up to the weight I was when I was 9 months pregnant. I've never been one for doing diets as I was pretty good at controlling my eating just through general healthy eating. But this time I felt I needed to be drastic to stop myself from making wrong decisions. I knew a little bit about Slimming World (SW) and had seen others being successful with it, so thought it may be a good place to start. My husband said he'd do it with me, which was even better. We both needed to eat healthier and having him do it with me would be a good encouragement. So far we've both lost some weight, not loads, but we're heading in the right direction. It's also given me something to focus on and really get involved with. I'm trying new recipes and starting to enjoy cooking again. There are occasions where I just want to reach for the treat or pick something up from the supermarket. The good thing with SW is you can have a treat (syns) and not ruin everything. But by me doing this, it has stopped me picking something up every time I'm at the supermarket. And when you're off work, you end up there a lot more. Today while I was out I needed to get a snack as I was getting hungry and still had a 20 minute walk home. I stopped at a Co-op and what do they have right there in the doorway waiting for me to buy, muffins and pastries. They are probably one of my biggest weaknesses. But I managed to walk out with a packet of chicken which is free on SW. Like I said before it's OK to have treats on SW, but you have to pick and choose what you're going to have. I'd much rather save up my syns and have a really nice treat, so this time I walked away. Try to do a little exercise. It's important to try and get some exercise where you can. I wasn't able to walk far for a while after giving birth and was a little worried about doing exercise which would be too strenuous. But once I could, I would take my baby for a walk, even if it was just to the local shop. I know I need to do more than that if I want my belly muscles to come back, but as they say every little helps. I try and get out most days. So if I don't have any plans, me and my baby will go for a walk. I've just started going to some baby play groups and it's either a 5 minute drive in the car or a 35 minute walk to get there. Today I decided to walk as the weather was nice, which worked out better for both of us. I get some exercise and my baby gets to have a sleep on the way which makes him a happier baby for playing. Have something to work towards - an event or a piece of clothing you want to fit in again. Another thing that's help me stay focused on loosing some of that baby weight is having something to work towards. This can be an event or a piece of clothing you want to eventually fit in again. But be realistic, you don't want to set yourself up for failure when you don't reach your goal which was set too high to begin with. For me it's an event. We are having a naming blessing for our baby when he's 6 months old. I'd like to either wear something I already own, or buy something nice. I gave myself just over 2 months to loose some weight. I probably won't be at my target weight by then, but I should hopefully be slimmer. And it's a short enough time frame to try and stay focused. The main thing is to try and not be too hard on yourself and give yourself time. What you've given your baby before they're even born is nothing less than amazing.